Located within the very isolated Northern Amazon area of Peru, getting to Iquitos is only possible by either plane or boat. 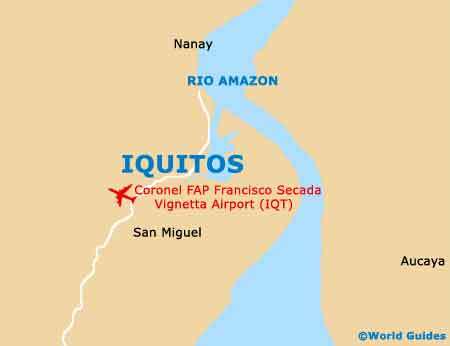 Cruises to Iquitos along the Amazon River (Rio Amazonas) are extremely scenic, although quite slow, and so many tourists favour flying into this remote Peruvian city, landing in the neighbouring Francisco Secada Vignetta Airport. Iquitos serves as the jungle capital of the Loreto Region and is the perfect place to explore parts of Peru's immense rainforest. The economy and affluence of the city owes much to its past rubber boom of the 19th century and the discovery of oil in the 1960s, and Iquitos is now enjoying much tourism and popularity. A number of commercial jungle guides offer their services and tourist information to arriving visitors, providing guided tours of the rainforest and its many attractions. Tourists are advised to look out for the Iquitos Times - a free local newspaper aimed at visitors and packed with related information, available from most hotels and restaurants. 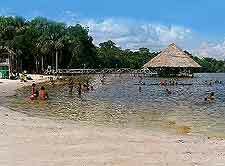 A number of the attractions found within Iquitos line the banks of the Amazon River, with both the Tarapaca River Walk (Malecon Tarapaca) and the Maldonado City Walk (Malecon Maldonado) being especially popular. Those holidaying in this part of Peru with children will likely enjoy spending time at the Amazon Animal Orphanage, the Pilpintuwasi Butterfly Farm, or the nearby Quistococha Lagoon, the latter of which comes complete with its very of zoological park and artificial beachfront. However, few sights come more impressive that the Belen Quarter (Barrio de Belen) of Iquitos, where traditional floating houses stand on wooden stilts above the water, to protect them from possible flooding during the rainy season. 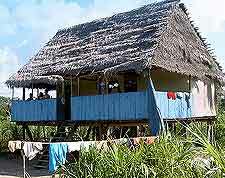 More information about Iquitos Tourist Attractions. 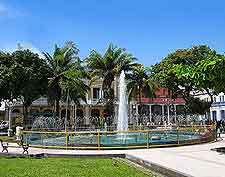 Within central Iquitos, the Plaza de Armas is far more than just a public square and is in actual fact more of a park, being surrounded by numerous places of interest, including some splendid colonial mansions. Locals and tourists alike tend to hang out at the Plaza de Armos, and during fine weather, many restaurants and cafes move their tables outside, immediately creating a friendly and buzzing atmosphere. Always rather interesting in Iquitos is the Iron House (Casa de Fierro), which actually originated from Paris some 150 years ago and has close links with the Eiffel Tower, today being used as a popular local restaurant, complete with balcony and views across the plaza. More information about Iquitos Landmarks and Monuments. Whilst it would be more than fair to say that the Amazon jungle of Peru is not known for its museums, Iquitos does contain a small selection, offering information about the influence of the river and the region's rich flora and fauna. The Municipal Museum and Library of the Amazon is situated on the Tarapaca Malecon and home to many life-size statues of different tribes from the Amazon, dressed in traditional clothing. Nearby and along Napo Street, the Municipal Museum of Natural Science is a good place to learn about native wildlife, while the outlying Camu Camu Gallery features numerous colourful paintings, often depicting Amazonian scenes. 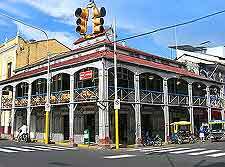 More information about Iquitos Museums. Those holidaying in Iquitos have likely come here to experience the wonders of the Amazon jungle first hand, and guided jungle expeditions are always recommended. Other nearby attractions include the Laguna Quistacocha, the historical town of Pevas, and the truly vast Pacaya Samiria National Reserve. 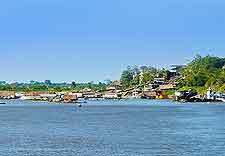 To the south-west of Iquitos, the port town of Yurimaguas is not to be overlooked and stands next to the Huallaga River. Further afield and to the far west, the city of Piura is located alongside the Sechura Desert and close to the Pacific coastline. More information about Iquitos Attractions Nearby.